Maryam was born in Tehran to an average family. From an early age she was acquainted with politics through her two brothers who were political prisoners. She was a bright and an outstanding student. She was kind and sympathetic and always tried to help those around her. She used to volunteer her summer vacations tutoring her less competent classmates. Maryam’s pure and modest feelings were always concerned with the suffering of impoverished people. With the beginning of the anti-monarchic demonstrations in 1978-1979, she actively participated in the demonstrations while she was only 14 at the time. Because of her young age and small physique, people used to pull her out of zones of conflict and take her home. But Maryam used to rejoin the rallies within a few days again. With the release of political prisoners from Shah’s prisons, her two brothers were also released, providing an opportunity for her to get to know the People’s Mojahedin Organization of Iran (PMOI/MEK). Gholam-Hossein, one of her brothers, introduced Maryam to the PMOI and its goals. Maryam joined the PMOI/MEK supporters at the age of 15 and began to promote and sell books and newspapers at school. Maryam was repeatedly expelled from school due to her political activities. However, with persistent effort, she was able to enroll in another school and continue her work even more passionately. During a peaceful demonstration on June 23, 1981, while enduring the kicks and punches of Khomeini’s club wielders, Maryam continued to chant “down with reactionaries” until she was arrested with a broken head and wounded body. She was subsequently taken to a stable made prison outside Karaj, west of Tehran. The torture and abuse in prison failed to break Maryam. She did not even disclose her real name to the torturers. Maryam was one of the most resilient and resistant prisoners of Ghezelhesar Prison’s notorious punishment ward known as the Residential Unit. [i] In 1984, she was transferred from the general cellblock to the Residential Unit to crush her resistance. She persevered, however, through all the vicious tortures, tiring the interrogators and torturers, and becoming an idol for the rest of her inmates. Maryam was finally released after enduring four years of torture and pressure both in Ghezelhesar and Evin prisons. During these four years, Gholam-Hossein and Abbas, her two brothers, had been executed. So, Maryam returned home to find her elderly mother left alone. The rest of her family had either been executed, joined the resistance movement, or gone underground. She had make great efforts to build contact with the PMOI/MEK. Eventually, she managed to leave Iran in 1988 and join the PMOI/MEK in Ashraf. Maryam’s strength was that she accepted any responsibility wholeheartedly and accomplished it in the best and timely manner, often without having adequate resources. It was with such a high spirit that Maryam stayed in Ashraf among the 100 residents who had to protect the residents’ properties until final disposition. On September 1, 2013, Maryam was killed in the attack by Maliki’s special forces. She was handcuffed and blindfolded due to her strong resistance, then shot in the head. 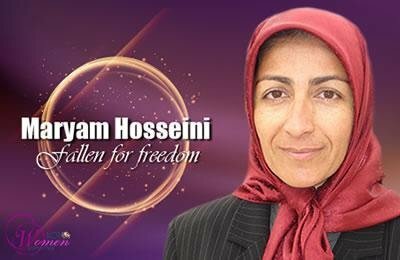 Maryam Hosseini and her 51 comrades thus joined the galaxy of 120,000 PMOI/MEK martyrs. Their memory and names continue to fight the clerical regime by inspiring the Iranian people and youths to rise and resist the mullahs’ dictatorship. [i] The residential unit was a torture chamber in Ghezelhesar Prison set up specifically for PMOI women prisoners with the aim of distorting their sanity. This was called white massacre since they tortured the prisoners to the point of irreversible insanity through various sadistic mental and physical cruel treatment. The most common method of torture was to keep the prisoner awake for many consecutive days until she completely lost sense of self, time and place and would inevitably hallucinate and suffer from delusions. The prisoners were blindfolded throughout the day and torturers constantly surveyed the unit. Unexpected attacks on blindfolded prisoners, accompanied by kicks, beatings and banging their heads against the wall, were also a common practice. The guards also compelled the prisoners to flog each other. If a prisoner did not comply, the guards would severely torture the other prisoner so that the former was forced to flog her inmate to reduce her suffering. They also forced the prisoners to mimic animal sounds. If anyone disobeyed, they would beat her inmates until she was forced to do as the guards ordered, in order to save the lives of her inmates. The prisoners were also routinely intimidated and humiliated. Lajevardi, the head of the torturers of Evin and Ghezelhesar prisons, had told this unit, “Our intention is not to kill you so you can become heroines. There are only two ways you can get out of here, either to repent (treachery) or become insane so that you are no longer useful for the organization.” This had given the interrogators and torturers an open hand to freely apply any form of mental and psychological torture with the intention of driving the detainees to insanity. Only a handful of the prisoners were able to relatively recover from the Residential Unit. The majority never returned to their normal state, and despite the passage of 30 years, they are still unable to recall and express what they were exposed to on a daily basis.